Our company offers a variety of industrial services to chemical, steel, and subsea equipment manufacturing facilities. The repeat business from our industrial clients demonstrates our commitment to meeting challenging schedules and layouts, as well as understanding the sensitive nature of operational interruptions. Our principals and staff bring a wealth of experience to support our clients throughout design and construction. A mobile steel platform was designed for maintenance access to the wings and landing gear of a Boeing 757. Requirements for the platform included elevation adjustment to raise and lower the floor at each corner. 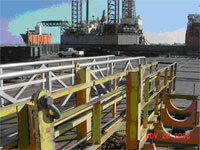 This suspended personnel platform was designed to be hoisted by crane load lines. All components of the platform were in compliance with OSHA 1926.550. 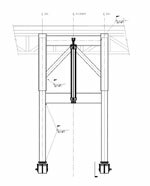 Produced design drawings and calculations for structural steel skid, piping and equipment arrangement for a skid mounted motor stator cooling unit. 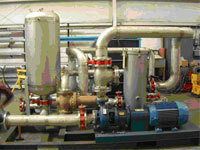 The unit was designed to remove 1.1 MW of heat for a ship propulsion motor.